A quick glance at an Acu-Rite wireless thermometer can tell you if you need a warmer coat before heading out the door. These thermometers provide a convenient way to check indoor and outdoor temperatures as well as the current local time. The thermometers consist of a wireless sensor to place outdoors and a main unit that you can set on a flat surface or hang on a wall. Open the battery compartment cover on the wireless sensor. Place two new AA batteries in the compartment. Put the battery on the left side in with the positive end up. Put the battery on the right side in with the negative end up. Replace the battery compartment cover. Open the battery compartment cover on the main unit. Place two new AAA batteries in the compartment. Put the battery on the top in with the positive end to the right. Put the battery on the bottom in with the negative side to the right. Close the battery compartment cover. Give the wireless sensor and main unit a few minutes to synchronize. Check the display screen on the main unit to make sure that it’s receiving the wireless sensor signal. The wireless sensor signal icon located next to the outdoor temperature display at the top of the screen should show one to four bars. Hold the “Set” button located near the bottom of the main unit down for five seconds to access the Clock Set Mode. Look for a blinking display that indicates which preference item you’re currently setting. The preference items occur in the following order: Clock Hour Mode, such as 12-hour or 24-hour, Clock Hour and Clock Minute. Press the plus symbol button located next to the “Set” button until you reach the setting you want. You can also hold this button down to move quickly through the setting options. Press “Set” to save the setting and move to the next preference item. Hold the “Set” button at any time while using Clock Set Mode to get back to basic setup mode. Press the “F/C” button located above the “Set” button on the main unit to set the temperature display to Fahrenheit or Celsius. Use lithium batteries when placing the wireless sensor outdoors in cold weather. Exposure to prolonged periods of temperatures under minus 4 degrees Fahrenheit can impair alkaline battery performance. Chaney Instrument Co. does not recommend using rechargeable batteries, because they operate at higher voltages. It can take as long as twenty minutes for the main unit and wireless sensor to resynchronize following battery replacement. Clock Set Mode will change back to basic setup mode automatically if you don’t press any buttons for 30 seconds. If you want to clear the maximum indoor and outdoor temperature readings stored in the main unit, press the “MIN/MAX” button located above the plus symbol button. You should see MAX displayed on the screen. Hold the “MIN/MAX” button down until dashes appear in the temperature display. These indicate that the MAX readings have been cleared. To clear the minimum indoor and outdoor temperature readings stored in the main unit, press the “MIN/MAX” button twice. You should see MIN displayed on the screen. Hold the “MIN/MAX” button down until you see dashes on the temperature display. Delgado, Amanda. "How to Set an Acu-Rite Wireless Thermometer." 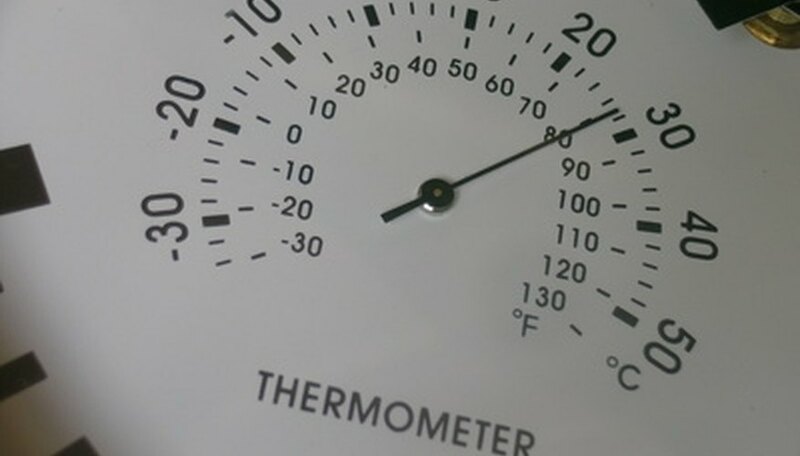 Sciencing, https://sciencing.com/set-acurite-wireless-thermometer-5844847.html. 24 April 2017.